When done right, they are sweet, succulent, and melt-in-your-mouth tender. When done improperly, at worse they are rubbery, fishy, and even sandy! The key, of course, is to purchase high quality scallops and not overcook them. The first part is relatively easy once you’ve found a good source for seafood. I picked up these gorgeous plump and fresh scallops from Whole Foods. They have no hint of fishiness. Instead, they smelled clean and almost sweet – the way scallops should smell. I decided to try Sous Vide. Could I achieve that perfect texture with this precise cooking method? “Sous vide” literally means “under vacuum” in French. Sort of a misnomer, this method of cooking actually involves two parts. Food is first sealed under vacuum in a plastic bag and then cooked in a water bath set at a very precise temperature. Sous vide cooking has a lot of interesting benefits. First, because you can precisely control the temperature of your water bath, you won’t overcook your food. This is great for restaurant cooks who can’t always predict exactly when something needs to be served. You can keep a steak at 130° F (medium rare) for hours in that water bath and take it out to sear just moments before the guests arrive. You can rig your own sous-vide system with a magic cooker, beer cooler, or a cast iron pot. I’ve tried the magic cooker method, with great success. Alternatively, if you’re not the tinkering type, you can use a professional unit, such as the Sous Vide Supreme. Recently, the folks at Sous Vide Supreme were kind enough to send me a unit to try out. Sous Vide Supreme is probably the first precision thermal water bath marketed towards home kitchens. Priced at $449.95, it’s still a bit steep compared to other kitchen appliances, though it’s a lot cheaper than the commercial ones, which start at around twice as much. Since I had already tried making sous vide steak and salmon, I thought scallops would be a natural next step. I had seen many recipes that suggested using a lower temperature (125 °F (52 °C)), but I was cooking chicken at the same time, and thus wondered whether I could throw them all in one water bath. I filled two different bags: one with bacon-wrapped scallops, thyme, and shallots; the other with just a sprinkle of salt and pepper. I stuck them both in the Sous Vide Supreme and set it at 140° F / 60 °C for 40 minutes. When the timer beeped at me, I took them out, dried them with paper towels, and briefly seared them on a hot cast iron pan just long enough to get a nice sear. Try to make this a brief as possible – like 30 seconds! Remember, your meat is already perfectly cooked! They were both fantastic. I’m sure some of it has to do with the fact that I bought beautiful scallops that had a wonderful sweet taste. But the sous vide method made it easy to cook them to a perfect consistency. Not a single scallop was overcooked. They were soft, buttery, and all around delicious. 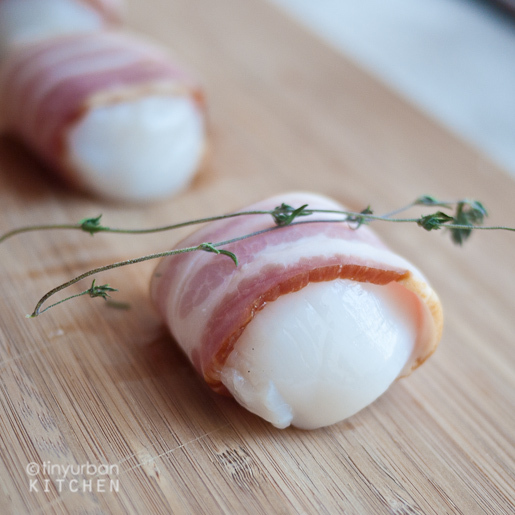 Wrap each scallop with one slice of bacon. Put the scallops in a single layer in the vacuum bag. Add thyme and chopped shallots. Seal under vacuum in a plastic bag according to the manufacturer’s instructions (I used Foodsaver). For medium rare scallops (preferred), cook at 125 °F (52 °C) in a water bath for about 20-40 minutes. For medium scallops (still delicious), cook at 140 °F (60 °C) in a water bath for about 20-40 minutes. The benefit of cooking at 140 °F is that you can cook it with other items (such as chicken breast) that need to be cooked at that temperature at the same time. Remove the scallops from the bag, dry well with paper towels, and briefly sear in a pre-heated grill pan on high heat just until nicely browned. Serve! As a food blogger, time to time I receive products from vendors to try out, to review, etc. The Sous Vide Supreme machine was sent to me by Sous Vide Supreme so that I could use the machine and take photos of the process and final products. The views expressed in the posts are completely my own. This is a great price as far as sous vide machines go. What a great opportunity to try out an appliance that is often out of reach for home cooks, but offers so much utility in the kitchen. Even my bro’s tried searing scallops for his girlfriend. I should “man” up and try cooking scallops myself, too! um, i hope u get to keep it! lol… been dying to try sous vide. Wow I’d love to try one pf these machines, lucky you! Those scallops look absolutely perfect! Yum, that looks mouth watering. Looks delicious! It’s just sad I don’t have that Sous Vide Supreme machine. I’ll see if I can get one. Thanks for the inspiration! We tried our own version of your recipe, and they turned out INCREDIBLE. I was just talking about scallops wrapped with roasted red peppers, but this sounds incredible!! I have a Joule but I know they will still turn out fantastic! Thank you for posting!